I've been wanting to start a collection of vintage storefront letters - all A's - for quite some time. 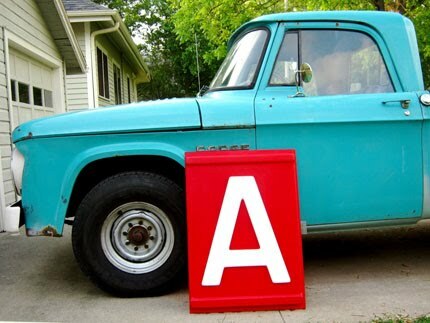 I saw this oversized red A on Etsy and it got me wondering if it would be better to have one giant A, or a huge collection of them. And once I had this collection where would it go? Is it silly to just do one letter? Or is it better to make a word? Or monogram? Should I even attempt to stick to a certain color palette? Or go bananas and grab whatever I find? Ideally I'd have one giant marquee A that lights up, much like the vintage B I saw at Brimfield in Andersonville. Of course they were selling it for around $750. No thank you. And I haven't had much luck perusing eBay. So that will have to wait. What are your thoughts, my confidantes? I love this idea too! I have been searching for "S"'s since I got married. I wanted a bunch of different sizes and colors to hang on the wall as you enter the house. Kinda like a welcome to the "S"tanding house! It's a great idea and I think you should go for it. But I would say either scale down the size and go for tons of colors or, go big and go neutral!!! I would pick up an electic mix of A's. 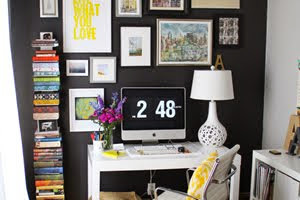 You know, different sizes, colors, fonts, textures and hang them on a wall in the entryway or stand them up on a table. I can picture it now. Hi from a fellow Syracuse design student! 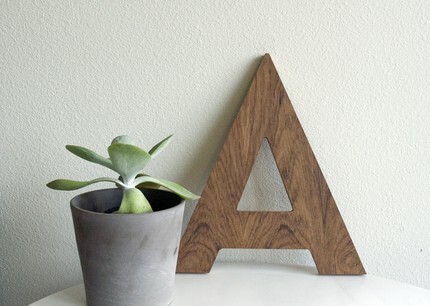 Hey Alaina, I saw these on Etsy the other day http://www.etsy.com/listing/37622869/hand-made-metal-letters-12-inch?ref=sr_gallery_27&ga_search_query=metal+letters&ga_search_type=&ga_page=2&order=&includes=tags&includes=title ,and you can choose the color you want. I like the idea of spelling something out, like Sixx Design did with "Desire" at the Hoboken gym they designed. I have been wanting to do the same thing. I was thinking of doing a large F (for my last name) in the center and then surround it with smaller f's. I agree- variety is the spice of life! 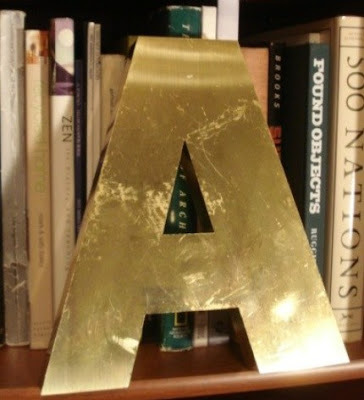 I'd collect any A that suits your fancy- it if resonates with you, the uniformity of A's would be striking no matter how different they all are! Okay, because I love you so (I realize I don't knooooow you, but ya know... blogger love:))- I did a little research. 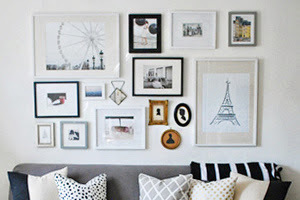 I don't really agree with many of the other comments saying that you should collect many and fill an entire wall. Great idea. En plus 'A' is a pretty letter. I think Victoria on sfgirlbybay has a collection of 'V's. Loooove the giant red A! Cute idea Alaina! I got a cardboard one at Papersource and decorated it, a bit five year old of me but fun none the less! Yeah, I have to agree- perhaps not too many! And maybe stick to neutral letters, plus the one pop of color? 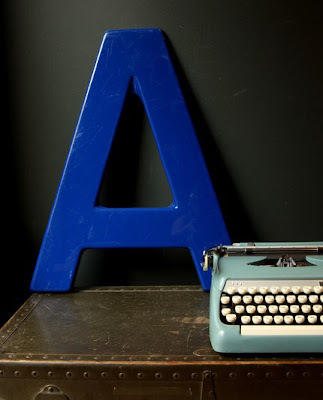 I love creative headboards, like the bookshelf one at Ikea... You could create a backdrop above your bed made out of letters. 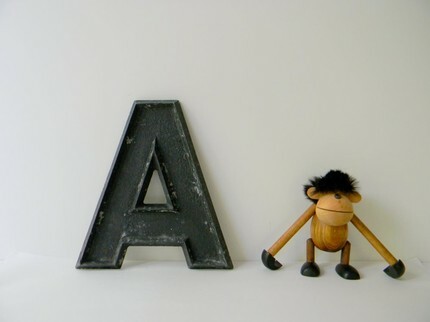 Hey from a fellow chicago blogger, I wanted to say that I really like the idea I have also been on a quest to find different letters for my wall, I have a couple of A's and S's for our family's initials. But what I really wanted to tell you is that the the randolph antique market in chicago has a lady who comes every month to sell all kinds of letters from signs - she had a bunch of light up one that were huge all the way sown to small brass ones and her prices were pretty decent. I picked up a few of the smaller ones but the 25/26 of september I think is the last weekend she's going to be there for this year. here is a link to my blog so you can see some of the things that she sells I took a couple of pics last time I was there.